If you’re looking for olde-worlde charm, look no further than the Roaring Gap Club. The unique Donald Ross-designed mountain top layout enjoys far reaching views from the fringe of the escarpment. The golf course itself is rather hilly and a little short by modern standards but you’ll need to look very hard to find a layout that is more engaging and fun than Roaring Gap. Leonard Tufts, President of Pinehurst, formed the club in 1926 as a private mountain getaway for the summer months and indeed, it was originally marketed as “the Pinehurst of the Mountains”. Unusually, its rather substantial clubhouse lies away from the main golf action, located on high ground behind the 4th green. When the original Ross routing document was unearthed a few years ago, restoration expert Kris Spence was brought in to study the size, shape and position of all the planned tees, greens and hazards. He then embarked on a program to cut back trees, refurbish bunkers and install new tee positions, lengthening the layout by almost three hundred yards. The most memorable hole on the card is the 340-yard 17th. Out of bounds on the right threatens the preferred line off the tee before an approach is played to a green that’s protected by a serpentine bunker to the front and left. The putting surface sits on the edge of a bluff, a thousand feet above the valley, from where the panoramic views are as good as any in North Carolina. Never before have I felt that 18 green-sites were perfectly located. Donald Ross has a long list of achievements in the state of North Carolina, and it’s experiences like a round at Roaring Gap that will make you appreciate his skills more than ever. In recent years, the course has undergone significant tree removal, green re-shaping and bunker restoration. Thanks to the leadership of Dunlop White III as a passionate member and golf course architecture expert, the club engaged with Kris Spence to wake up this sleeping beauty located up high in the Blue Ridge Mountains. The process to unearth historical assets was an arduous time-consuming process – a true treasure hunt. At Tuft's (the Archives Museum/Library located in Pinehurst), Dunlop White uncovered the original 1926 design plan which served as the Holy Grail. Additionally, the Club uncovered 9 full hole plans with Ross notations, 6 green sketches and also unearthed an early-aerial photo from the County's Natural Resources, Soil and Water Conservation unit. Senior members contributed old black-and-white photos, which effectively distinguished those design features that were original from those that had been added, modified, or removed through the years. In the words of Dunlop White, “Clubs should devote more time in an attempt to discover how their course looked and played in the beginning”. I couldn’t agree more. There is plenty of charm about this massively underrated course – including the “feel good story” about the previous club pro, Mr. Bailey Glenn, who was there for 37 years before his son (and current club pro) Bill Glenn took over. Bill had grown up at the club as a young boy and now proudly serves at the professional. Decades of care and attention as to how this club should operate has been upheld by the Glenn family for all golfers to enjoy. This course offers blind tee shots, wonderful doglegs, brilliant changes of elevation, magnificent routing – and naturally gorgeous views on the front nine greens through the corridors of trees, and, of course, the highly documented epic views spanning hundreds and hundreds of miles as you make your way back to the clubhouse. 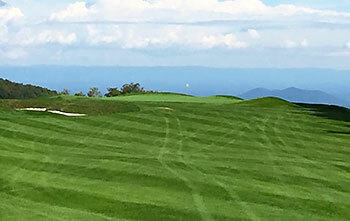 The 17th at Roaring Gap takes “infinity green” to a whole new level. Surprisingly, Ross brings the course to a close with a long par 3, with a newly expanded menacing green. The course doesn’t get a lot of play, but under the daily leadership of the hugely talented Superintendent, Erik Guinther, this 1926 gem plays in spectacular condition prior to its closure towards the end of October every year. You’ll have a tough time picking a favourite hole! Heard it from a friend, who, heard it from a friend, who, heard it from another this was a course not to miss. Having benefited from a recent restoration, this little known Ross gem has been revitalized back to its glory days and finds itself in amazing form. What a great pleasure to come up in the mountains and experience this fantastic course. 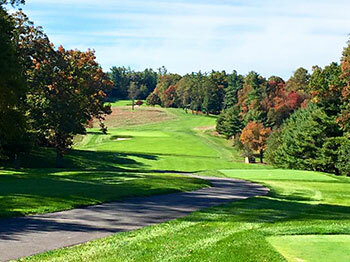 The renovation process was spearheaded by Dunlop White III, who clearly set his heart and soul into realizing the full potential of Roaring Gap, which included a tremendous amount of tree removal to reclaim width in the playing corridors and improve the turf with much needed light, air and nutrients. The course also benefited from a complete 18-hole green restoration, which was hugely successful. The renovated green complexes were certainly the highlight of the course and were returned right back to the size, shapes and dimensions that Ross originally had in mind as specified from his green drawings hanging on the golf shop wall. They possess very interesting gentle undulations and are full of internal contours. The greens surrounds are equally excellent and provide all kinds of fun and challenging short game options. My favorite holes were the 6th, 12th and 17th. The par 3, 6th plays slightly downhill to an amazing volcano green. A short to mid iron depending on the wind and tee used but not a green to miss and very easy to leave yourself a challenging two putt with all the undulation. The par 4, 12th is a wonderful medium length par 4 with a very interesting drive, leaving an uphill approach to a green steeply angled back to front. Not the green to end up long or be above the hole as your left with a lightening quick putt. 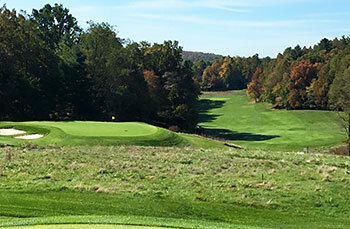 The par 4, 17th is a short par 4 that helps Roaring Gap leave a lasting impression. A wonderful green set on the ends of one of the most beautiful vistas of the valley you are going find. Approaching this green you have the feeling that missing long may just result in your ball descending far into the valley below. If I lived in the area I would 100% want to be a member up here! What a great and interesting property: it pretty much has everything you could ask for; wonderful views and vistas; rolling hills with plenty of bumps, uneven terrain and a Donald Ross routing making the golf amazingly fun, challenging and varied. Roaring Gap is still highly underrated in the US rankings, this is simply because it has been flying under the radar until recently and not enough raters have paid it a visit or have seen it before the restoration. Give it a little time and it should by all means assume its well-earned position in the Top 100 Courses in the US. I personally see it entering the list somewhere between 60-100. Time will tell. Roaring Gap is worthy of discovery. It's special and unique for so many reasons: 1. Club Heritage: For one, there aren’t many clubs in the world of golf that can claim such an illustrious heritage. Leonard Tufts, the second-generation magnate of the Massachusetts family that founded and operated Pinehurst Resort, was a co-founder of the club and served as its first President. Tufts thought so much of his Donald Ross design that he would passionately advertise it as the “Aristocrat of all his Courses” and called it “The Pinehurst of the Hills”. 2. The Graystone: not many clubs in golf can sport a clubhouse with such history and grandeur. It’s effectively a museum that stands out like a sentinel above the entire property. The golf course sports two-iconic golf holes: 1. Hole 6: It’s one of the most distinctive volcano-shaped greens on earth. The 142 yarder is fittingly named “Do-Drop”, because tee shots either “do” land safely, or they “drop” down the steep embankments surrounding the green. There are few other holes in the world like Do-Drop. The twelfth hole at Bald Peak Colony in New Hampshire is the only one that comes to mind. 2. Hole 17: The golf course naturally reaches its crescendo at the seventeenth green perched dramatically on the crest of a 2,500-foot bluff with 75-mile scenic vistas across the heart of North Carolina. In the distance, Pilot Mountain, Hanging Rock, Saurartown Mountain and the Winston-Salem skyline are etched in the horizon. Please note also that Ross carefully shaped knobby humps and bumps around the perimeter of the seventeenth green to mimic the silhouette of the foothills in the backdrop of the hole. Unforgettable for its strategy and beauty. The Par 5’s have been awarded among the best sets in the world by Tom Doak in his Confidential Guide. 1. Hole 7 and Hole 11: These two par 5’s have heaving uneven terrain, rumpled fairways, fiendish side slopes and steep plateau greens. With these type undulations, who needs bunkers? Yes, Ross left these holes bunker-less. A rarity. 2. Hole 16: shares its fairway with Hole 15 and stretches 130 yards in width. Very unique, but that’s not it. The green is blindly located (hidden) in a dell, and its putting surface is a “punchbowl” as indicated on Ross’s original green sketches. Rare again! Tiered Greens: Hole 13, 15 and 18: These are sensational holes with one-of-a-kind, two-tier greens. Here the tiers meander across the putting surfaces. They don't simply dissect it in half like most tiered greens. Great stuff! Cross-Bunkers: Holes 4 and 5 -- by the Graystone Inn -- are strong holes with restored fore-bunkers and cross-bunkers on each. Cross-bunkers on hole 2 and hole 14 were also restored. While most Ross restorations around the country omit the recovery of these features, as meaningless and antiquated, Roaring Gap recovered them all. Their visual effects are stunning. Best Restorations! The authenticity of the sizes and shapes of the Greens are dead-on, and no club has taken such a methodical approach of recycling the evolved green turf to preserve it's aged look, texture and playability. At 6,450 yards, this is a museum piece. What it lacks in length it returns in character three-fold. Fun, charming, authentic with an unforgettable setting, if you can find it. The most impressive aspect of Roaring Gap is its setting, perched at the top of a cliff, 1800 feet above the adjacent town of Thurmond. The finest view is from the 17th green, where Donald Ross once again showed there’s not much new under the golf architect sun by building an infinity green in 1926. The recent renovation has restored the humps and bumps at the back of the green that Ross is said to have used to mimic the hills in the distant background. The day I played, one could easily see 100 miles. The 9th at Royal County Down, #7 at Pebble, the opener at Jackson Hole……whatever your favorite golf viewpoint, you’ll still be impressed by Roaring Gap’s 17th. It’s not the only hole with a view, however. The front nine plays along the west side of what the locals call the “Eastern Continental Divide”, the point at which rainfall ends up in the Gulf of Mexico. And the 13th tee boasts a view of the spine of the Blue Ridge Mountains, not far from Mt. Mitchell, the highest point east of the Rockies. No, I haven’t forgotten that, rather than being a geography site, this is a golf site. Early in this century, two members of the Donald Ross Society, president Dunlop White and Captain Michael Fay, convinced the club that much of Ross’s original work was no longer present. The club hired Kris Spence and made sure he had all the original drawings and photographs for a faithful restoration. Spence’s reclamation of so many portions of greens lost to the modern triplex mower resulted in as fine a set of Ross greens as you’ll find anywhere. Some include features not often associated with his work: a plateau at 13, a Maidenesque (two high spots separated by a trough at the back) 14th and a Punchbowl at 16. A couple outstanding Ross trademarks include the volcano par 3 5th and the finishing hole, a drivable par 3. The green contours here are such that I never got a good stimpmeter reading on the speedy greens as I was unable to find a flat enough spot on which to roll golf balls. While the green complexes are the highlight of Roaring Gap, from the tee, things are rather mundane. Only a pair of holes have fairway bunkers to challenge the golfer’s mental and physical skills, and there are only two dogleg holes, though # 1 is, indeed, a doozy. I was told that Tom Doak plans to include Roaring Gap as one of his 18 soul-stirring U.S. courses in the upcoming version of his Confidential Guide. The place has a great vibe and had the entire course matched the green complexes, I’d have rated it six balls. Alas the tee shots are in four ball territory, so I give it five overall. Steve, this is a nice review. Like you I had the pleasure of playing Roaring Gap last week on Thursday the 8th. A beautiful day. You seem very informed about the surroundings and the course, I imagine being part of the Donald Ross Society helps that. I'll post my review soon. Roaring Gap is classic Donald Ross design and the best mountain course I’ve played with tight fairways and excellent domed greens. It’s a good challenge but also fair. The club itself is great and has a tremendous atmosphere.